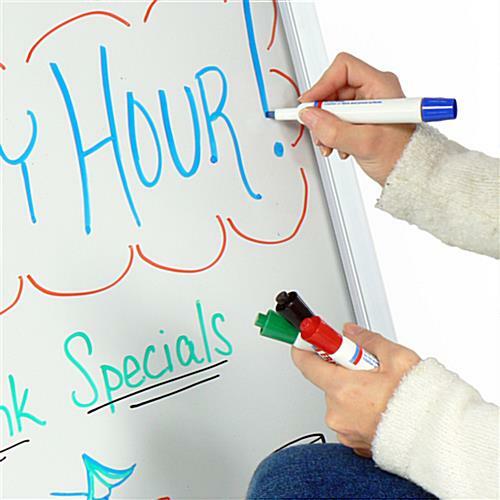 This write-on sidewalk sign is an extremely eye-catching way to display your advertisements! Sidewalk signs, also called A-frame sidewalk displays, are a unique way to display your message. These sidewalk signs can be used as both a write-on board and a poster frame. 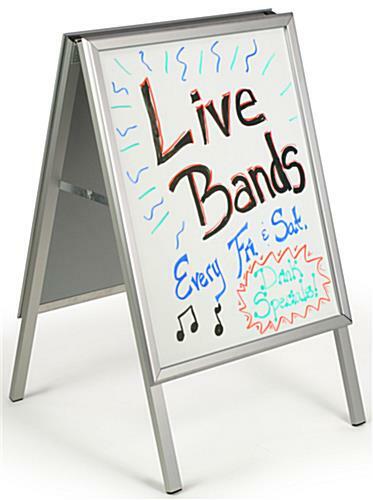 We sell these double-sided sidewalk signs with an acrylic, write-on insert so you that can create an effective message that you can change as often as you like. 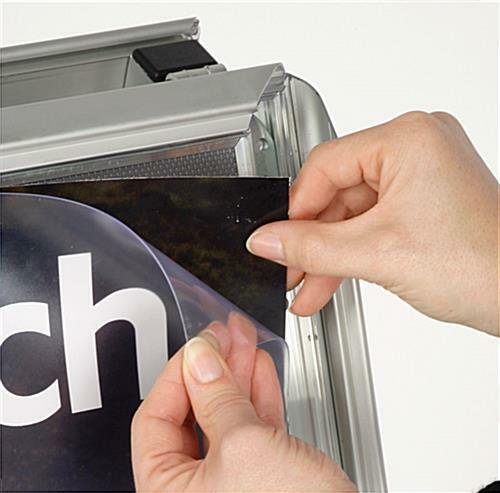 Your message can be removed by just snapping open the frame sides and removing the acrylic panel. 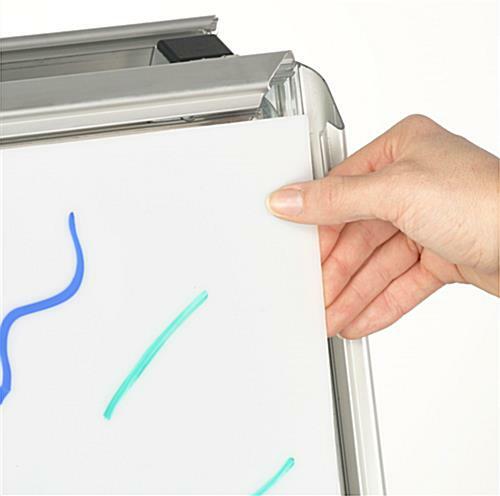 The snap frame covers ½" of your signage on each side. 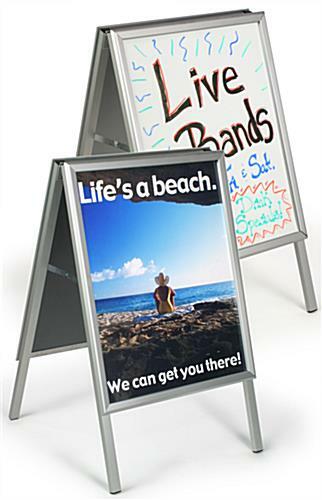 A-frame sign displays, like these sidewalk signs, are made of anodized aluminum so they are lightweight. Our portable write-on sidewalk signs fold up so they can be easily transported. 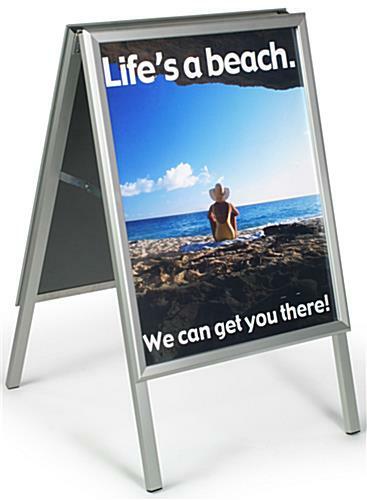 We sell these portable sidewalk signs with a weather resistant plastic lens. This lens is non-glare so your poster can be seen in daylight or under a streetlight. These sidewalk signs are meant for outdoor use, however, it is recommended that you bring your sidewalk sign in during any type of precipitation. This is because our sidewalk sign is meant for use with wet erase markers only, which will come off in the rain. Please Note: Product is not intended for use in inclement weather, including high winds, rainstorms, or snowstorms. 18.0" x 38.3" x 26.3"